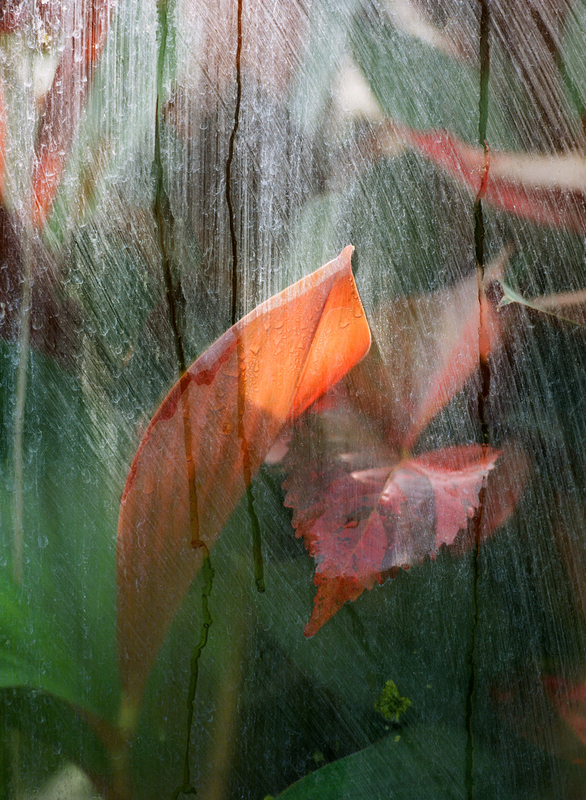 A series of abstract, impressionist photographs which explore the world of tropical plants living behind glass. In England in 1844 Henry Fox Talbot placed a leaf on a sensitised sheet of paper, covered it with glass, exposed it to light and obtained its impression on paper. This image appeared in ‘The Pencil of Nature’, the first-ever photography book. Nearly two centuries later Caroline Gavazzi gives a new interpretation to Fox Talbot’s leaf, bringing the plant new life. 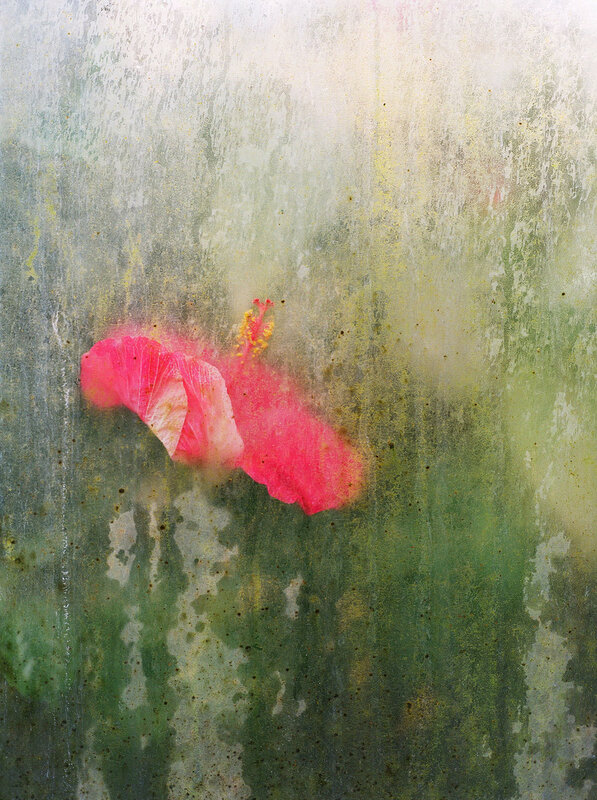 Caroline Gavazzi has photographed a number of plants held in a greenhouse that both protects and imprisons them, depending on your point of view. Before photographing them, she observes and studies them, but it is the colours and indefiniteness of shapes that suggests to her a vision of the world such as the one of the artistic movement she loves and favours: Impressionism. Moving away from realism is her choice. 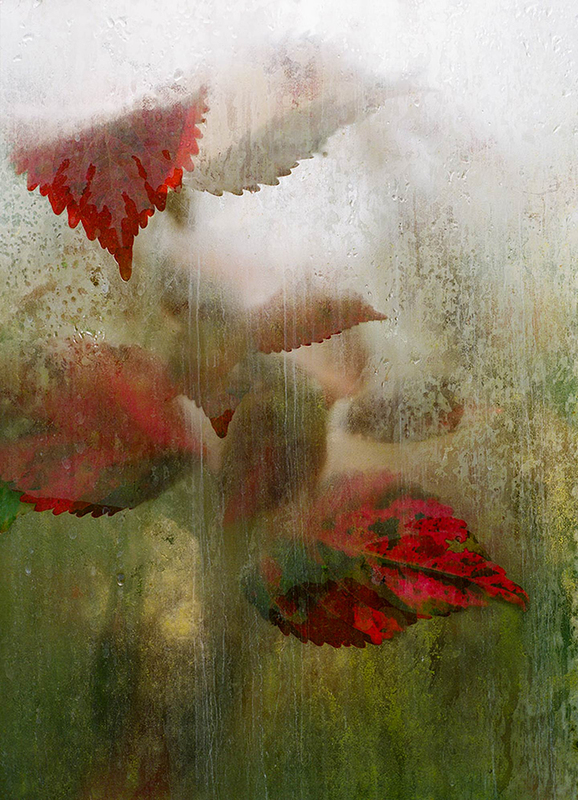 Caroline Gavazzi also confronts herself with glass, the one through which she photographs these plants: she plays with light, focuses on the droplets that run across the glass, creating unexpected colour effects. The dialogue between inside and outside is now more intimate, as it is the photographer herself who enhances the intensity of her feelings, the strength of the sensations she wishes to share with those observing her works. The plants are pervaded by intense vitality: you can notice it when they crowd towards visibility, when one lays a leaf on the surface of the glass, when a flower blooms silently removing itself with quiet modesty from direct sunlight. It is not, even though it would seem so, a fairy tale intuition – the most recent plant neurobiology research confirm how plants have an ability to “see”, chasing light, moving to seek it out; how they perceive sound through vibrations, and recognise the signs of danger. 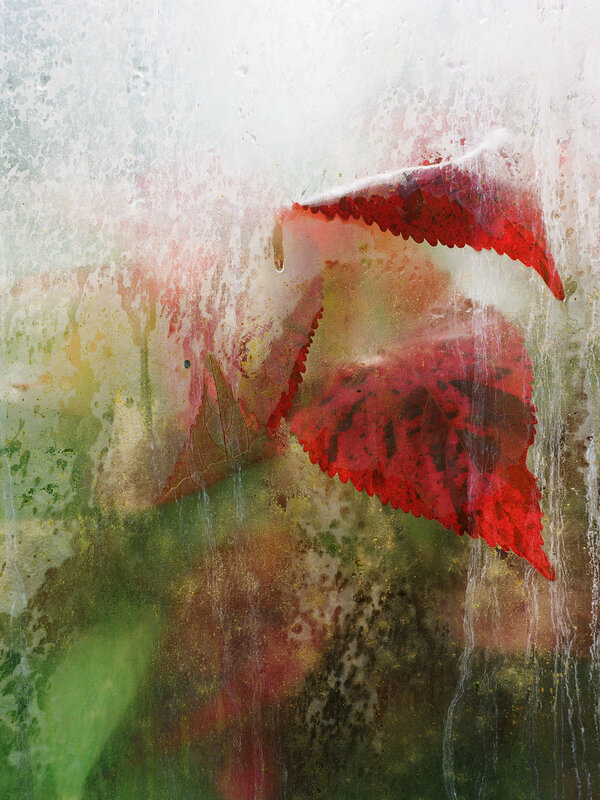 Caroline Gavazzi has a direct dialogue with the past, the one of Fox Talbot and his leaf imprisoned in glass. She wonders, is this a barrier used as protection to enable those plants to survive better, is this a glass cabinet inside which the conditions of an eco-system with an artificially-monitored equilibrium is created, or is this the prison from within which the plants send out a desperate call to freedom? The question remains by choice open. With her delicate and poetic approach, Caroline Gavazzi captures the atmosphere of a mysterious world through which a vibrant vitality floats through, like a single sigh. Caroline Gavazzi is an Italian/French photographer who studied photography at Spéos Photographic Institute in Paris and at the London College of Communication in London. After a successful career in commercial photography specializing in interiors and lifestyles, with regular features for international magazines such as Vogue, House & Garden and Country Living, Caroline shifted to creative photography in the early 2000’s. This was a natural evolution for her towards pursuing her intellectual interests and seeking new forms of expression. Currently, Caroline focuses on a genre of photography she refers to as ‘plastic’. Overcoming a realistic vision, she tackles different subjects with a symbolic take, often concentrating on the act of revealing what is concealed beneath the surface. She ‘designs’ photographic installations that lever on three-dimensional effects and on the visual displacement created by layers of material, thus inducing spectators to critically share the questions that her research produces. Caroline exhibits her work in fairs, institutions and galleries around the world and was recently awarded with two prestigious prizes for her work at the Mia Photo Fair’17 in Milan and the Fix Photo Festival’17 in London. 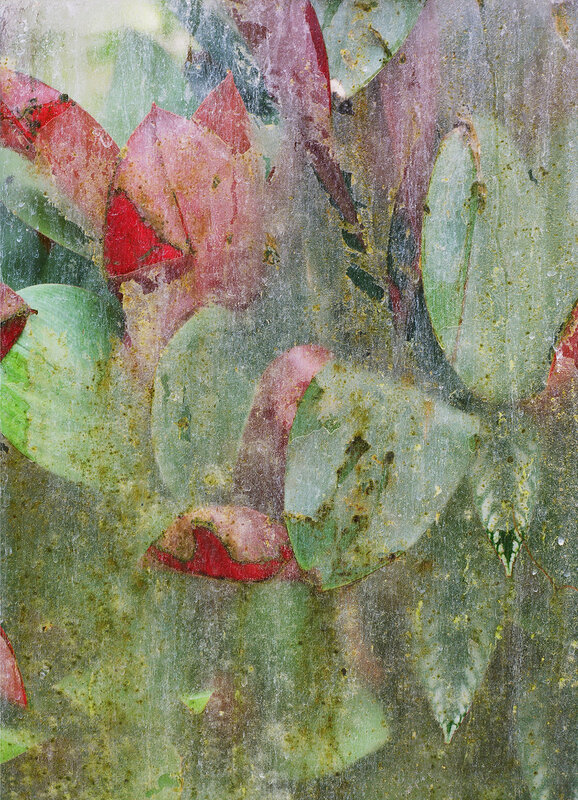 You can view Caroline’s series of abstract photographs in a new show entitled Tropical Sighs at the Brick Lane Gallery in London from 5th July until 10th July 2017.